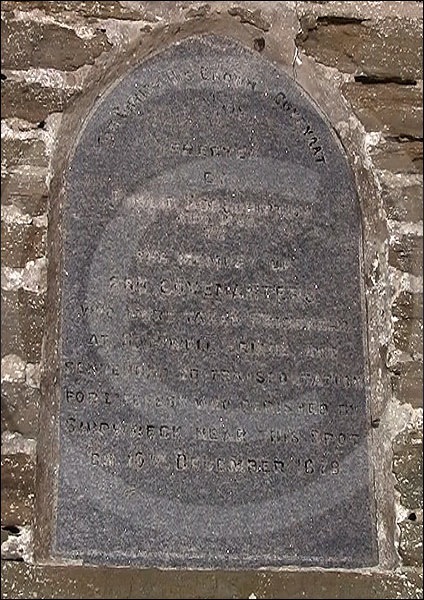 Situated on a commanding peninsula with steep cliffs to one side and rolling fields to the other, is the Covenanters Memorial at Deerness on the mainland of Orkney. Made of brick and standing possibly 10m tall, the monument at Deerness is around 300m from where a boat full of covenanters sank during a storm. The Scottish Covenanters (also called Whigs), were a group of people in the seventeenth century who covenanted to hold themselves and each other accountable for reformation of religion in their land. The Stuart kings of the time favoured episcopalianism, with the monarch having Divine right. Covenanter presbyterians could hear of no man, not even the monarch as being the leader of the church. They signed a Covenant to confirm their opposition to the interference by the Stuart kings in the affairs of the Presbyterian Church of Scotland. When Charles II was restored in 1660 to the throne, a great deal of suffering, torture, imprisonment, transportation and executions would ensue. In 1679, The Battle of Bothwell Brig, saw defeat of a Covenanter’s uprising and around 1,200 prisoners were rounded up at Greyfriar’s Church in Eginburgh. 250 of these prisoners were bundled on board “The Crown of London“, awaiting transportation to the American colonies as slaves. She set sail from Leith with the prisoners confined to the hold to avoid escape, her fist stop was Orkney. ‘The Crown’ ran into a storm at the edge of Deer Sound in December 1679. The anchor broke causing the ship to be dashed onto the rocks. The captain and crew escaped to safety. One crew member broke through into the hold with his axe but only 48 prisoners managed to survive. The rest of the prisoners drowned as the ship sank and over many days, bodies washed up on the beaches, they were buried at Scarva Taing. Built by public subscription, including a large donation of £50 from a surgeon, the monument was inaugurated on Wednesday 22nd August 1888. It is reported that behind the granite slab is a small recess where a set of jubilee coins in a bottle were deposited. Situated outside St Magnus Cathedral in nearby Kirkwall is a polished Aberdeenshire red and grey granite drinking fountain. 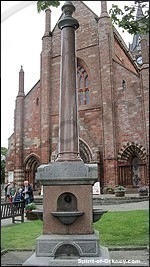 Looking slightly out of place against the red and yellow sandstone of the cathedral this public water fountain was erected using funds left over from the building of the main monument at Deerness.